Who knew that Pro-Am painting was not only a thing, but actually a spectator sport? This is exactly what Sky Arts Portrait Artist of the Year 2018 is and it returned for its 4th series this week. If you thought the Bake Off was middle class, then this will blow your John Lewis socks off. 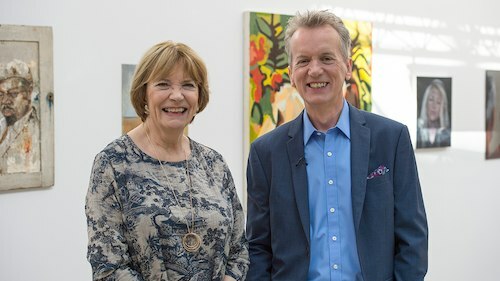 It’s presented by Joan Bakewell (whose cut-glass accent seems to have acquired a strange west country twang) and Frank Skinner. This competition is open to professionals and amateurs alike, which seems a bit unfair. Can you imagine if Val from Bake Off came face to face with Gordon Ramsey in the tent? Even Masterchef splits the amateurs from the professionals, but it would appear that in the artistic community such divisions don’t apply. The entry requirements are that you send in a self-portrait you have painted, and if they like it, you are in. The location isn’t a tent, but a sort of rotunda affair built in the middle of the courtyard at the Wallace Collection in London, which is split into three sections, each with a “celebrity sitter” being painted by three artists. Presumably the production company couldn’t afford to pay to hire the location for the full day as most of the time members of the public seemed to be wandering around looking over the artists shoulders. I guess this is where one of those caricature artists you come across on the promenade in Spanish resorts would be at an advantage. They could probably cope with distraction of people muttering “looks ‘nowt like them” in stage whispers from behind you. The three “celebrity sitters” (sorry it just amuses me that not only could you be a professional “sitter” but could even be a “celebrity sitter”. I love sitting. I could do it professionally) were David Tennant, Michaela Coel and Chris Martin…sorry, James Morrison. They have four hours to paint their “Celitter” (sorry, got bored typing “Celebrity Sitter”), so in Bake Off terms, effectively they just have to do the Show Stopper without all the other rounds. I always feel relating everything back to Bake Off is easier in these situations. Even the plinky plonky music sounded like Bake Off. (Yep, any staccato piano music is now officially known as “Bake Off Music”). There were, of course, 3 judges who all seemed remarkably nice. No nasty judge saying “listen…I like you colour palette…I like your brush strokes…but your perspective is all over the show…it’s a no from me”. At this point I should confess that I am a rubbish artist. I can’t even draw those “Be like Bill” stick men (it’s his hat. I can never draw hats correctly). I am in awe and admiration for anyone who cam draw, paint pr sculpt anythings as I know I just don’t have the skill or talent to do so. I have however been a “sitter” in my youth. At school, I was asked to sit for the O’Level art class exams (this was Old Skool-Old School) and as it meant that I got out of double chemistry, I was there in a flash. What I do remember is that it was quite tedious and at times painful. This was years before mindfulness and meditation. These days people would pay good money just to sit in a chair for four hours with their thoughts, but I was a teenage boy and sitting still was trickier than I thought. The positions adopted by the Celitters (©Shouting at the Telly 2018) was the subject of much debate by the judges. “He looks uncomfortable…he’ll regret putting his feet like that”. Tennant seemed the best Celitter in my opinion; jutting chin, soft hands on the chair arms, a sitting pro ever I saw one. Michaela seemed have her legs crossed in a different way every time we came back to her and you could see Chris…sorry James got cramp in his feet because he just didn’t think though his starting sitting position. School boy error. Not that they really had to be there at all. One thing that really surprised me was some of the artists worked off photos on their phone. One contestant was a teenage girl and she didn’t even look at poor old David. She took his photo of him on her phone, stuck her headphones on and began drawing. This style earned the scathing comment from one of the judges that she was merely “proficient at copying”. Truth be known, he didn’t need to be there and she may as well just have copied his picture from the latest edition of Heat magazine. Does she not realise how many voice overs he could be doing instead of sitting there? Painting on the TV is not new. I was raised on Paint along with Nancy (did anyone ever really paint along with her?) who seemed to favour oils and knives to paint with. Channel 4 obviously favoured watercolours in Watercolour Challenge, but on SAPAOTY2018 (Sorry can’t be bothered typing Sky Arts Portrait Artist of the Year 2018 anymore) you can use whatever material or size of canvas your heart desires. Some people chose really small canvases (bit of a cop out, but at least they finished their portrait) while one contestant had a massive canvas and did a tiny James Morrison in the corner and left the rest blank (she didn’t get through). Some painted in oils, some used pencils and one guy seemed to use a bag of charcoal to roughly smear Tennant’s features all over his canvas (he didn’t get through either). I have already stated my art credential (i.e. none) but it’s funny how after half an hour of watching a show like SAPAOTY2018 you become an expert. “Oooh that’s clever, yes I like that…wow she’s really got his personality with that….that’s just pants”. At the end of the sitting the Celitter (I’m definitely going try and get that in the Oxford Dictionary by the end of the year) got to choose and take home their favourite portrait (Tennant took the one which basically looked like a photo of him from OK) and then the judges chose their top three. Then, taking into account their original self-portrait, they chose a winner to go through to the semi-final. Spoiler alert: the proficient copier won. Part of the idea of these programmes is to inspire the public to get painting, and in that spirit, I have bought myself a canvas and today will attempt a self-portrait using emulsion, gloss and tar, all applied using a shoe. But I won’t paint myself wearing a hat. Whilst you are here, we are trying to grow our little blog, so any shares, likes or subscriptions would be greatly appreciated. To receive updates from Shouting at the Telly, either subscribe using the buttons, like our Facebook page or follow us on Twitter.